On Sunday the Swiss electorate will be asked to vote in a referendum on whether to impose migration quotas on European Union and European Economic Area nationals – a system the country currently uses for non-EU/EEA migrants. The referendum question doesn't specify how large or what shape the quotas would take, but would instruct the Swiss Parliament to draft legislation addressing the immigration issue within the next three years. Ahead of Sunday’s vote, it is looking very tight with 43% expected to vote in favour of the quotas and 50% against, according to a recent poll by GFS.Bern. 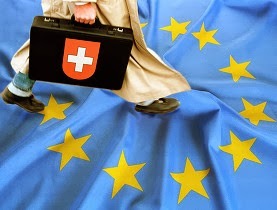 If the referendum result goes in favour of introducing quotas, not only would it potentially end free movement between Switzerland and the EU as we currently know it, there could be much wider ramifications for the Swiss-EU relationship that would provide a landmark test case. The Swiss-EU agreement on free movement was part of a bundle of agreements known as ‘Bilaterals I’, which covered six other areas including the Mutual Recognition Agreement, which simplifies the admission of Swiss products in to the EU market, trade in agricultural products and civil aviation (other aspects of Swiss-EU relations are governed by a 1972 free trade agreement and there is also a Bilaterals II – in total there are 20 main and 100 subsidiary agreements in place). Crucially, Bilaterals I contains a ‘guillotine clause’ stipulating that the contents can only take effect together: if one of the agreements were not to be prolonged or terminated, the others would also cease to have effect. Nothing will happen immediately on Monday morning, irrespective of the referendum result, because if the Swiss government is mandated to impose quotas it would have to decide what form this would take. Nevertheless, it would set up a very difficult negotiation with Brussels, which, if it wants to play hardball, could scrap the entirety of the rest of the agreement. Now, it is not difficult to see why this could have consequences beyond Switzerland's relations with the EU (some would argue, it will also be another test of how the EU responds to referendum results). But, should the row escalate and other aspects of Switzerland's trade cooperation with the EU be cut off, many would argue that it illustrates that a pick and mix UK relationship with the EU from outside (particularly a carve out from EU immigration that UKIP would favour) would be difficult or impossible to pull off. If, on the other hand, Switzerland was able to renegotiate its relationship to impose some form of restriction on EU migration, however minor, this would give those who favour UK exit an important precedent to point to. For this reason, we suspect the EU will take a very hard line with the Swiss government if the Swiss people vote for quotas on Sunday. 1. Bad timing by the proposers, would have been much better to wait a bit and have the Rums and Bulgs coming in considerable numbers usually accompanied by some scandals of the human traffic, mass begging, grand scale theft, abuse of entitlements kind (just to mention a few we have seen lately). Their public image is rubbish with a lot of people so anything confirming that (whether it is bias or not) will be a problem. 2. Donot see them making this one tbo. Polls clearly point to status quo. 3. Anyway this issue will come back more frequent than a Quebec independence referendum. Seen the rather marginal difference, albeit clear in the advantage of the status quo, a few 10000 Roma and a proper gang of Rumenian pickpockets and the average Bulgarian prostitution ring will likely do the job next time. 4. If so the EU has a tough call to make. It can become strict to set an example. However clearly Germany would not like that at all. And the Swiss importing considerably more from the worldmarket will hardly be EU positive. A lot of EU companies are only competitive because of all the paperwork for EU imports. 5. Would have been much better to tackle the immigration issue so that it becomes acceptable in a lot of pretty relevant countries. Doesnot look like a very clever strategy (no turnips in it as well) which will likely come back to hunt them. As out of control immigration is simply the stuff people adjust their voting behaviour on. As said hardly clever to look for more problems as if they didnot have enough of those. 6. Ad6 is a point of attention. The current Swiss problems will be mainly with the working and underclass immigrants as anywhere else. However the measures proposed affect ALL immigrants. Something that could happen everywhere at this moment. Imho it makes absolutely no sense to defend nett receiver immigration and jeopardise the nett contribution immigration as a consequence thereof. Simply over-the-borderline moronic at least in an economic, financial sense and also seen the fact that most social issues are with the people that are likely heavily overrepresented in the nett receiver group. Unexpected result, polls were thightening but there was still a considerable margin. 1. Wonder if this was the populist effect or simply another failure by the pollsters. Results are getting pretty unpredictable this way. Difference between final result and last polls was way too large. 2. Big call for the EU. Be tough and risk 100 Bn trade (as it is both ways) and make business for especially German cies more complicated. On top of that any typical EU reaction will come back to hunt them and in all the wrong places (with the payers where half or more of the population is already critical for a big part because of EU immigration. Damagecontrol. Not jeopardise trade relations and not further p-off the anti immigration side before the EP election. As they are rather full of themselves and need both their braincells for that, my guess is most likely the latter. With the EU the bad PR move is always the most likely the last couple of years. Means Cameron has a new ally. The Swiss themselves want probably to do on damage limitation as well. And de facto they are a sort of semi-member. And what would be more helpful than reform (with for the Swiss a strong focus on immigration). Would be interesting to see in how far the UK could block 'sanctions' in this respect for the Swiss. Effectively the UK has very little to gain from a hard approach and will as said likely win a new ally. And as said by OE this could be a model that might work for the UK as well if that is achievable. Freetrade but with limited bottom end immigration. I simply donot see how anyone can keep that out of the discussion. This is another proof that popular views are changing on low half immigration and rapidly. Or maybe better this group now has found ways to get it on the political aganda. Looks like that from complete outsiders they in a short time have become a political force that puts all the traditionals under pressure. Saw in the recent Wilders poll that 81% of the Hols is against given Rums and Bulgs entitlement rights. Nothing wrong with that poll btw. In fact it was a lot more objective than a lot of lefty polls that usually use plenty of words like ultra-right, nationalistic, extreme right, populists etc. Probably one of the reasons why they often underestimate support for Faragian and LePennish politics. Anyway dynamic on this is Dave-positive. moves things higher up the political agenda. It is always good to have the other side of the table, which has picked up the hobby of shooting one of their own feet, in the spotlight as frequent as possible. Well done Switzerland for listening to their people! What a SHAME and DISGRACE that the larger EU nations have not called referendums on issues such as this before. It has taken a non-EU nation to show how EU nations should behave. What will the EU do now? Will they bully Switzerland into a corner and start a European conflict or will they respect Switzerland's right to live to live how they want in peace? If Switzerland can have a referendum on immigration, then so ought Britain also. Come to that, so ought the people of the Somerset Levels, Kent, & Chertsey have one on the EU's Flood Directive - officially known as DIRECTIVE 2007/60/EC OF THE EUROPEAN PARLIAMENT AND OF THE COUNCIL, which covers the assessment and management of flood risks, & is dated 23 October 2007. These flood-affected people would almost certainly vote to be excluded from this ridiculous & damaging EU directive which has caused such immense hardship to the people concerned. And if they quite rightly wanted to be excluded from the EU's appalling blundering over flood policies, so should the rest of the UK be also. Just like the Swiss having an immigration referendum, there should be a British referendum on repatriating both flooding & environmental matters back to Britain - & similarly one on the UK's very regrettable membership of the EU. The more horror-show disasters like this one are caused by the pernicious EU, the easier it will be to win a UK EU In/Out referendum! And then it will be time for Article 50 & the Norway Option! The commission are gnashing their teeth at this result, no doubt they will be insisting that the Swiss vote again and again until they "get it right", like they did with the constitution. Delighted that for the first time since Lisbon Treaty was rejected the actual PEOPLE and not a lot of pen-pushers pretending democracy. From Open Europe this 'voice of -the-people' should be sacrosanct so please no humming and hahing around the issue trying to finesse something from it. NO TREACHERY PLEASE - `GO WITH IT OE! How does the EU solve a problem like the Ukraine? Italian PM Letta will resign: What happens next?